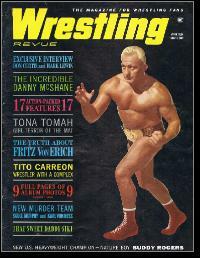 Herman Rohde, better known as “Nature Boy” Buddy Rogers, was born February 20, 1921 in Camden. He was a police officer before he was discovered in June 1939 by a local wrestling promoter. He was billed as 6'2" and 227 pounds, although he was actually only 5'11" and barely 195 pounds. His breakthrough match was a victory over Strangler Lewis. 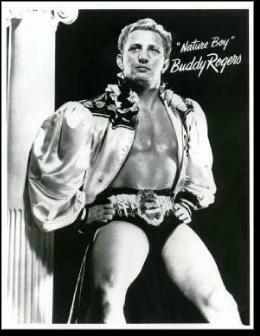 After moving to Houston in the 1940s, he adopted the name Buddy Rogers. He won the Texas Heavyweight title four times. One of the wrestlers he defeated was Lou Thesz. It marked the beginning of a rivalry between the two that would last for more than two decades. After moving to Columbus, Ohio in the late 1940s, Buddy bleached his hair and began calling himself “Nature Boy.” He had an impressive physique, good looks, and a charismatic personality that was perfect for television, which brought pro wrestling into millions of homes in the early 1950s. That being said, Buddy was among the most reviled champions in sports. He strutted around the ring during matches (now a common affectation) and took cheap shots at opponents when they were supposedly helpless. In post-victory interviews he liked to joke that it couldn’t have happened to a nicer guy. Buddy’s popularity as a TV icon helped him sell out arenas across the country. It marked a new era for wrestling, which in the past had relied more on the skill and reputation of athletes like Jim Londos and ex-NFL star Bronko Nagurski. Thanks to Nature Boy, it was becoming less of a sport and more of a spectacle. His matches with longtime friend and fellow Camden native Billy Darnell—famous for wearing a leopard-skin caveman outfit—were particularly popular. By the early 1960s, Buddy was one of the top-drawing personalities in American sports. His “Match of the Century” against Pat O’Connor in the summer of 1961 drew 38,622 fans—a record that stood until 1984. The gate of $148,000 also set a new record. In the years that followed, Buddy was nagged by injuries. The National Wrestling Association (NWA) wanted a new champ, and forced Buddy to wrestle his old foe, Thesz, for the championship. Buddy lost this meeting, but retained the pro Tag Team title (with Handsome Johnny Berand) until 1963, when they split. Buddy and Johnny eventually reunited to defeat Bruno Sammartino and Bobo Brazil. When the World Wide Wrestling Federation (WWWF) was formed in 1963, it recognized Buddy as its champion. Unfortunately, Buddy suffered a mild heart attack soon after. Nevertheless, he was pressured to defend his title against Sammartino, and Buddy lost. Buddy and Johnny Barend were scheduled to defend their tag team title in a rematch with Sammartino and Brazil in the autumn of 1963, but Buddy decided to retire. He was replaced by Gorilla Monsoon. Ironically, by this time Buddy had become less of an ad guy (or “heel”) and more of a beloved veteran. He was credited with inventing the Figure-Four Grapevine, a leg-lock still used in pro wrestling. During the 1970s, Buddy became a manager. His wrestlers included Jimmy Snuka, Ken Patera, Gene Anderson, and Big John Studd. He also developed a feud with the new “Nature Boy,” Ric Flair. The two actually wrestled —Buddy was in his late 50s—and Buddy won. At this point, obviously the outcomes were being scripted. Later, Buddy went into the ring with Snuka for a tag team grudge match against Ray Stevens and manager Lou Albano. He fractured his hip and retired from pro wrestling for good. There was some talk in the early 1990s that Buddy would re-enter the ring when yet another “Nature Boy”—Buddy Landel—came on the scene. But the match never came off. Buddy suffered a series of strokes in 1992 and died on June 26, 1992 at the age of 71.